IMCDb.org: Triumph TR 6 P Saint Police in "Britain's Best Drives, 2009"
Family album photo from owners of a village shop which used to be petrol station. Bloke is their father who according to commentary regularly filled up vehicles quite happily with his lit cigarette in hand as shown. Maybe a TR6P Saint, any info on date/context if the picture? The location is Brown's Village Stores at Llandogo, north of Tintern on the A466. 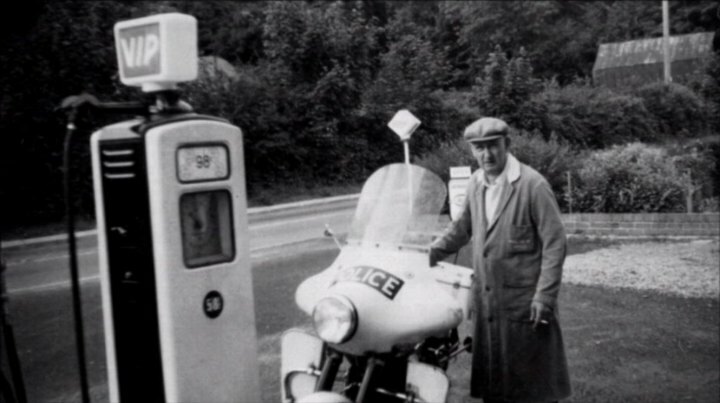 I'd guess from VIP pump logo and possibly a Duckhams Q20/50 pavement sign behind the bloke it's 1960s, maybe 1970s; pump seems to be 98 octane instead of 4 , so after the grade names changed.